Have you noticed the medieval-looking baskets with chains on metal poles around campus and wondered what they are for? The baskets are targets for a new nine-hole disc golf course that snakes around the perimeter of campus. Disc golf is played much like traditional golf but with flying discs instead of balls and clubs. Players stand near the tee and try to get their disc into the basket in the fewest number of throws. The project was initiated by Kyle Stephan ’14, a former SGA president, who got the ball rolling discs flying, by approaching the Student Activities and Athletics departments to obtain approval, advice, and, eventually, funding to establish a course on campus. 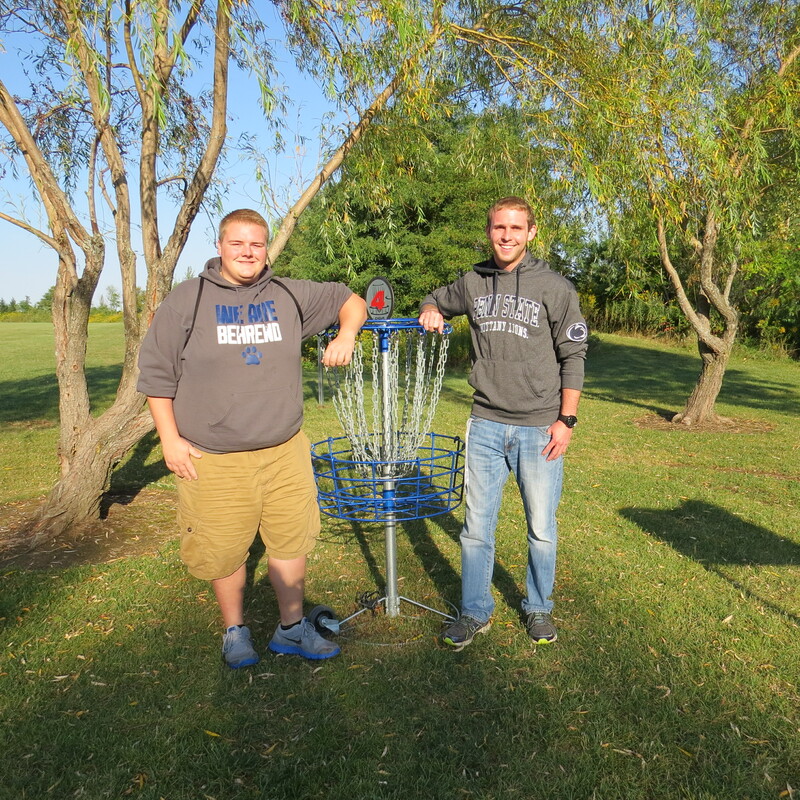 Stephan was joined by Mechanical Engineering majors Trey Neveux and Mark Malecky, and Psychology major Tyler Ferraino, who worked together to design the course, locate equipment, and secure funds. The students did the majority of the work on the course themselves, with assistance from the Erie Disc Golf Club, the college’s Maintenance and Operations department, and with instruction from Dr. Mike Naber, lecturer in geosciences, on using Geographic Information System (GIS) to layout and measure the course. Tyler Ferraino, right, and Trey Neveux. Though the graphics for the tee markers are still under production, all of the targets/baskets are set and the tee markers (plain white signs) are in place. The course starts in front of the tennis court/baseball fields near the Jordan road entrance to the college. From there, it snakes around to the old soccer field and then up and around the new track complex before finishing up in the woods across from the track near the bridge to Erie parking lot. An online map that you can use on your Smartphone while you play can be found here. 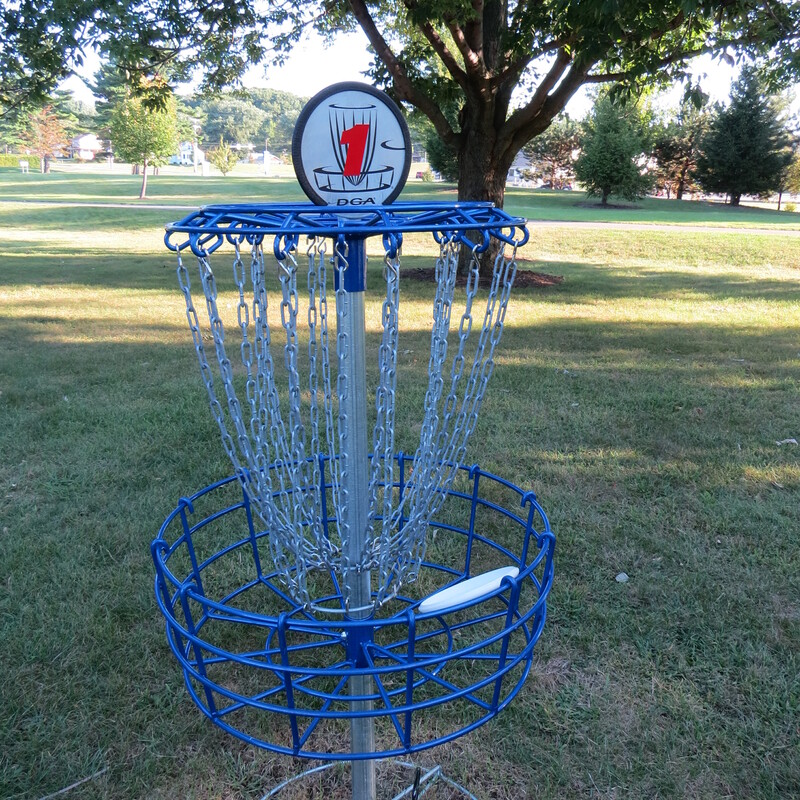 A basic disc golf set contains three discs—a driver, a mid-range disc, and a putter. Just like in golf, the driver is used for long drives from tee, the mid-range disc is used for shorter distances, and the putter is used when you’re close to the target. There are at least ten sets of discs available for students to borrow for free at the RUB desk (and Neveux says there are more to come), or you can pick up your own set at a mass retailer or online for less than $30. Standing at the tee (currently marked with plain white signs…graphics are in production! 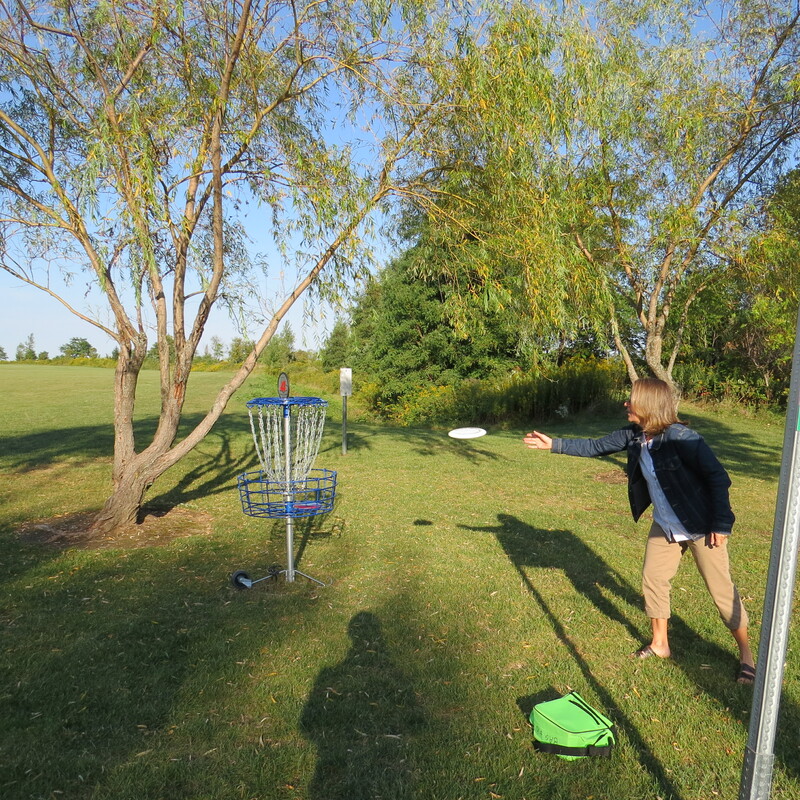 ), throw your driver disc toward the basket. Players — typically two to four, but more is OK, too — take turns throwing their discs with the one whose disc lands the farthest from the basket going first (like golf). One point (stroke) is counted each time the disc is thrown and when a penalty is incurred. The goal is to play each hole in the fewest strokes possible. A disc that comes to rest in the basket or chains constitutes a successful completion of that hole. Most of the holes on Behrend’s course are a par 3, but there are also two par 4s and a par 5. Map here. The player with the lowest total strokes for the entire course wins. Learn more about how to play disc golf here. Neveux and Ferraino spent some time introducing me to the sport on a recent weekday morning. It was a lot of fun and it wasn’t hard to figure out how to throw the discs to my advantage (most drivers arc left) and when to switch discs to make use of the mid-range and putter discs. By the third hole, I had a pretty solid grasp on the sport and enough skill to get the disc in the area I wanted it to be. Learn more at YouTube, where you can find plenty of videos with tips on disc throwing technique. Neveux, who serves as president of the Disc Golf club at Behrend, says they are already thinking of expanding. And, with the club’s dedication and promotion of the sport, they’re sure to have plenty of players, too. 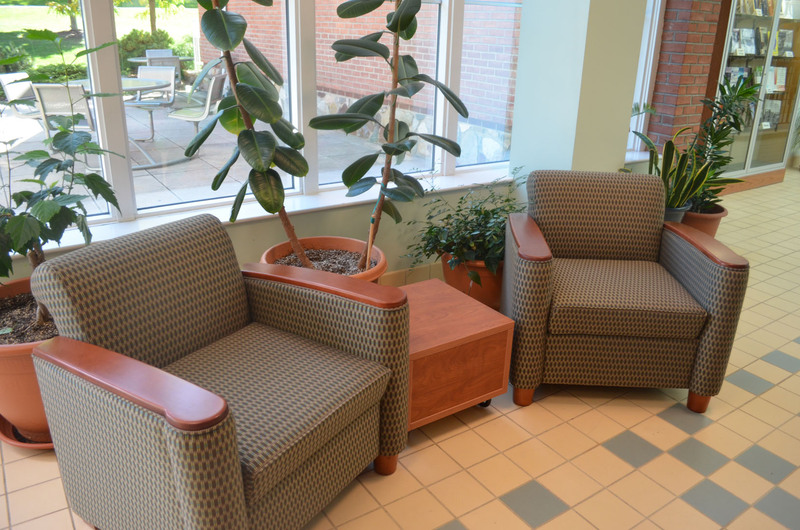 Have you noticed the new have-a-seat-and-stay-a-while environment at Irvin Kochel Center? The stiff, metal benches that once lined the halls are gone, replaced by attractive plush chairs and wooden end tables. On the lower floor, the computer kiosks have been revamped and carpeting put down to add warmth and help muffle echoing footsteps. The changes are largely the result of suggestions made by students. “Projects done by students in CAS 252: Business and Professional Communication helped drive many of the improvements to the civility and quality of the Kochel physical and social environment, including the digital signage screens, the up-scale coffee machine, the new furniture, and the printer near the new computer kiosk,” said Dr. Rod Troester, associate professor of communication. According to Dr. Ken Miller, senior director of campus planning and student affairs, funds from the Student Facility Fee paid for the furniture and carpet, funds from Technology Fee paid for the computers and kiosks, and Housing and Food Services provided the coffee machine. “It was really a team effort to improve a highly-trafficked area,” Miller said. Students seem to have embraced the kinder, softer Kochel Center. When I walked through on a Thursday at 2 p.m., nearly every comfy seat in the house was taken. The SFF Committee also funded the construction of The Galley (which Housing and Food Services outfitted), lighting of the soccer/lacrosse field, Reed Auditorium and lounge renovations, and hydration stations across campus. Future projects under consideration include, the Mary Behrend Monument and Memorial Garden, a recreation center, and a Frisbee golf course. As for those metal benches that were removed for Kochel? They will likely be repurposed for outdoor use around campus.